In November 2010 Diane and Stephen became parents to Chloe and then the fun began. We had often heard the statement 'Disabled child = disabled family' and we were determined not to let this become true of Chloe or ourselves. We quickly learned that wheelchairs are extremely limited in the places they will comfortably go. Stephen looked into and eventually purchased the largest child carrier he could find that Chloe would fit into. The day after we bought the carrier we took a trip to Derbyshire and Stephen and Chloe climbed Thorpe in what seemed an incredibly short time. The idea was born that we could climb something a little more adventurous and then the idea grew into the climb becoming a fund raising event. We asked the Headteacher at the school Chloe attends if there was anything he really felt the school needed. He told us about the need for a trampolene so that the children could benefit from Rebound Therapy. After looking into the costs we were told that the trampolene would be around £4,000. The target was set and the expedition planned for September 2011. After lots of training so that Chloe got used to being in the carrier we successfully completed our quest, raised the money and purchased the trampolene for the school. 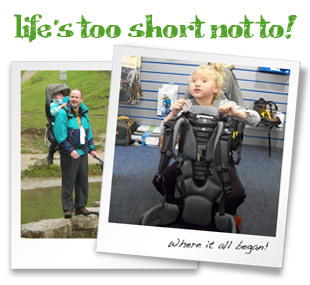 On this occasion the quest was to climb Snowdon with Chloe in the carrier. Our first attempt unfortunately was eventually rained out, we had never seen so much rain as that day! A fortnight later we returned and had another attempt, the weather at ground level was perfect unfortunately it again closed in at the top as the pictures testify to but although rather wet we managed to complete the climb (Diane, Chloe's mum went up on the train) have some lunch before returning to base. This certainly showed us, had we been in any doubt that Chloe is up for just about any challenge and does it with incredible good humour. Later on we raised funds to enable a small group of older pupils from the school to have a weekend away in Snowdonia. We have come to realise that many people are interested in what we are doing and have been kind enough to support us. With this in mind we decided that we needed to formalise our fund raising activities, form a charitable trust and try to make it easier for people to donate to the Trust and also to be able to acknowledge those people who have sponsored us with various items of equipment. 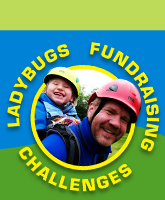 To launch our Ladybugs Trust we gave ourselves the challenge of climbing four buildings in London, St Pauls Cathedral, The Monument, Tower Bridge and The Heron Tower which we did on the 29th August 2012 (the day the London Paralympics opened).